The spacecraft will launch on a SpaceX rocket Wednesday at 6:51 PM ET. On Monday evening, NASA plans to launch a brand new satellite into orbit, courtesy of a SpaceX Falcon 9 rocket. Called TESS (the Transiting Exoplanet Survey Satellite), the spacecraft is designed to detect planets outside our solar system (called exoplanets) that are relatively close to our solar neighborhood. We have a spacecraft that's currently in orbit of the Sun that has a similar job. It's called Kepler, and in the nine years it's been in space, this little satellite has found 2,342 confirmed exoplanets, with 2,245 more candidates that still need to be studied. Thirty of these are confirmed to be within the "habitable zone" of their host star, which is close enough for liquid water to exist on the surface but not so close that the planet is scorched by the star's heat. (It's also called the "Goldilocks" zone, though presumably, there are no bears to be found on these distant worlds). Kepler's original mission, which was designed to last three and a half years, was to point itself at a single group of stars in the Cygnus-Lyra region. As a result, it constantly monitored the brightness of around 150,000 main-sequence stars using an onboard photometer. By looking at a tiny part of a very big sky, Kepler was able to monitor when the brightness of these stars dimmed even the slightest bit, which signaled that something (like a planet) might be moving in front of it. (This is called transiting). Scientists then analyzed the data that Kepler sent home and were able to confirm its exoplanet discoveries. 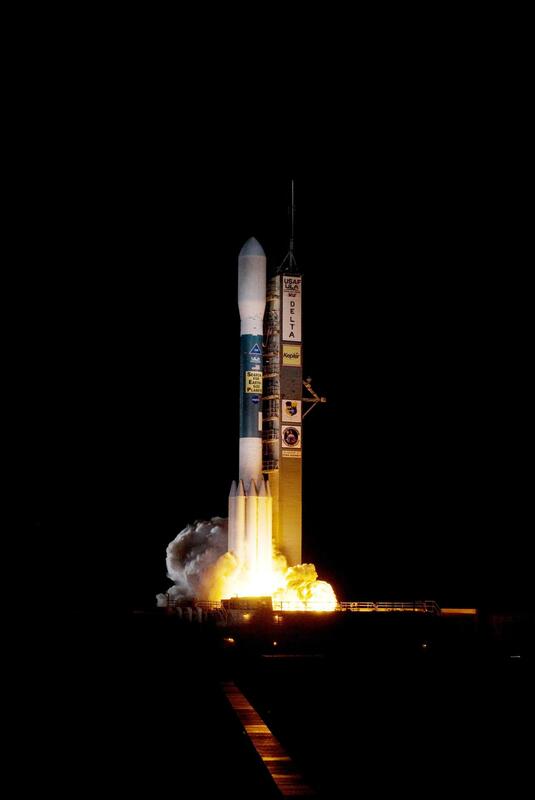 The night launch of Kepler. Thanks to Kepler, we know that exoplanets are incredibly common in our galaxy -- scientists have discovered that there are actually 1.6 planets for every star in the Milky Way. Before Kepler, we didn't know much about these planets at all. TESS will operate differently than Kepler did. We don't need to know whether there are exoplanets out there anymore. Now, we want to know more about the distant worlds we do find. That's hard with Kepler's data because so many of its discoveries are far away -- too far to really glean most details about these planets. That's where TESS comes in. 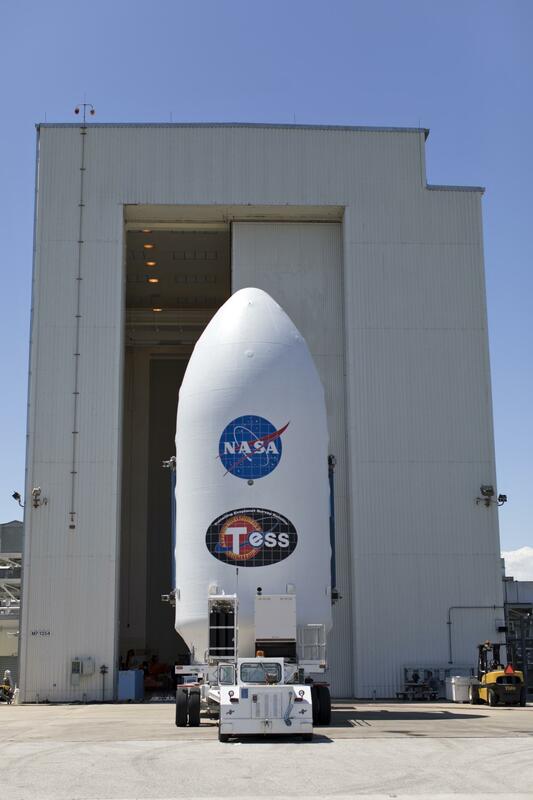 A SpaceX Falcon 9 rocket will carry TESS into space, launching from Cape Canaveral Air Force Station's Launch Complex 40 in Florida. The brief launch window opens at 6:32 PM. Unlike Kepler, TESS will actually be in an elongated orbit of the Earth, with an orbital period of 13.7 days. After launch, the closest it will ever come to Earth is 67,000 miles, which will keep it outside the hazards of the Van Allen radiation belts. During its two-year mission (which will probably be extended if the spacecraft works properly), TESS will study over 200,000 stars. The Falcon 9 payload fairing containing TESS. As previously mentioned, Kepler worked by examining and measuring the brightness of the stars it was focused on. TESS will do the same, searching for dimming brightness when a planet transits its host star. But there's a lot more than scientists can tell from a transit than just whether an exoplanet exists. They can tell the size of the planet; when planets orbit their host stars, their gravity actually acts on the star. When that happens, the star "wobbles," and the bigger the planet, the larger the wobble. Gas giants will cause a much more significant wobble than a small, rocky planet like the Earth. Rather than honing in on a small section of the sky, TESS's field of view will be 400 times greater than what Kepler's was. But even more crucially, TESS will focus on stars that are close to us. This matters for multiple reasons: It will allow for faster readings and confirmations, but more than that, it will let us glean much, much more data about the specifics of the planets we've detected. This is where the stars' distances become crucial. Many of Kepler's discoveries were around faraway stars that are are relatively dim as viewed from Earth. As a result, there was limited data to work with. But because TESS is looking at closer, brighter stars, scientists will be able to follow up on the satellite's discoveries with ground-based telescopes and learn more and more about these new worlds we're discovering. Update: A glitch pushed the launch back, which is now scheduled for Wednesday evening at 6:51 PM ET.